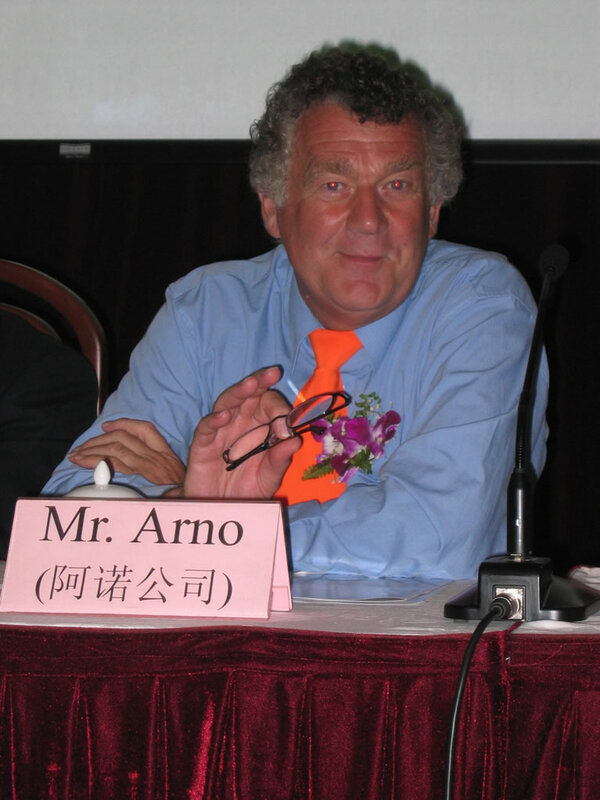 Jürgen Sanders, Ph. 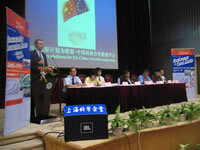 D. (far left and far right), First Counsellor Science and Technology, European Union, Delegation of the European Commission, Beijing, P.R. 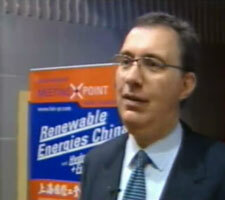 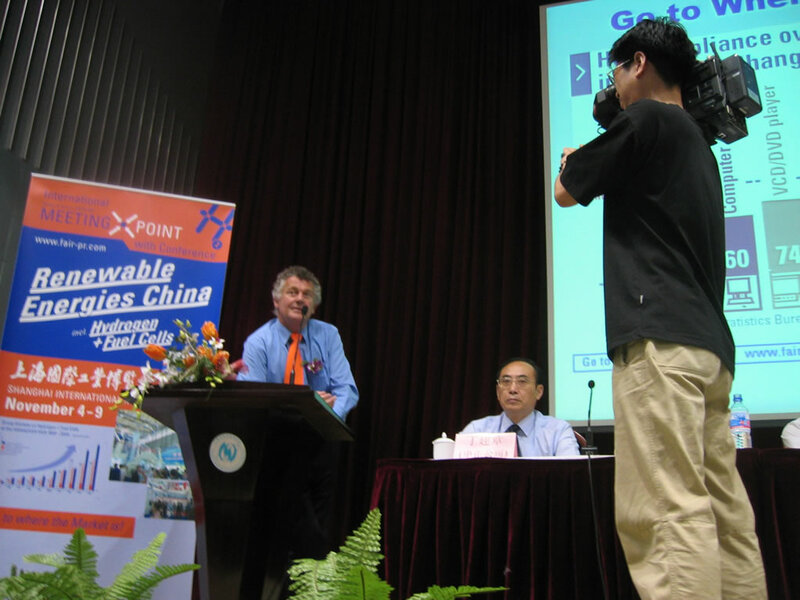 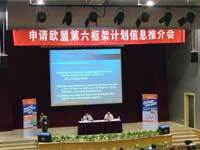 China, at his speech on how to participate in the 6th Framework Programme 2002-2006. 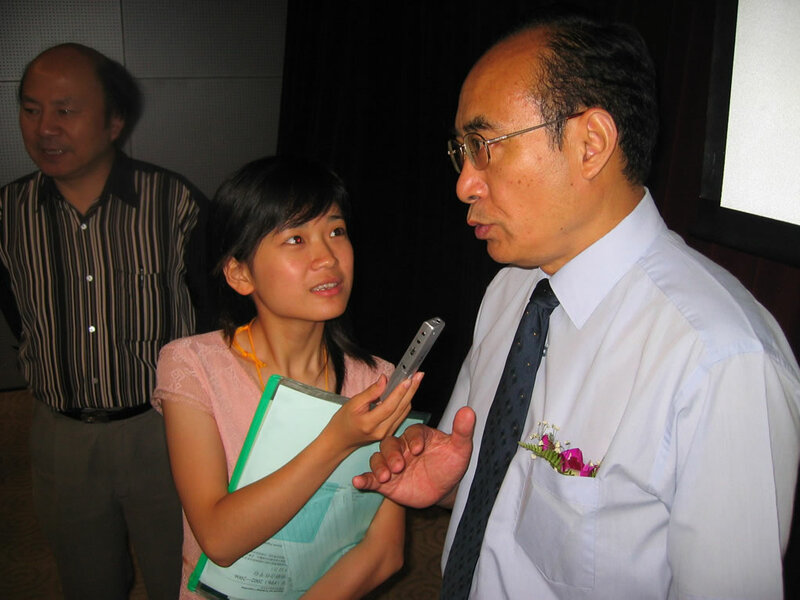 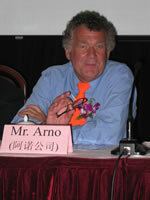 The TV interview with Dr. Sanders was transmitted on CCTV9 on July 6, 2004. Ms. Cui Xiaohui (middle picture right), Assistant (Science and Technology) from the European Union, Delegation of the European Commission, Beijing, P.R. 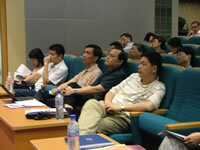 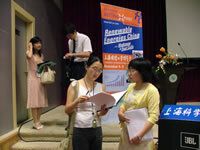 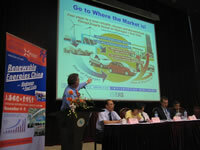 China also gave her explanations about the 6th Framework Programme 2002-2006 to the more than 100 Chinese attendants. 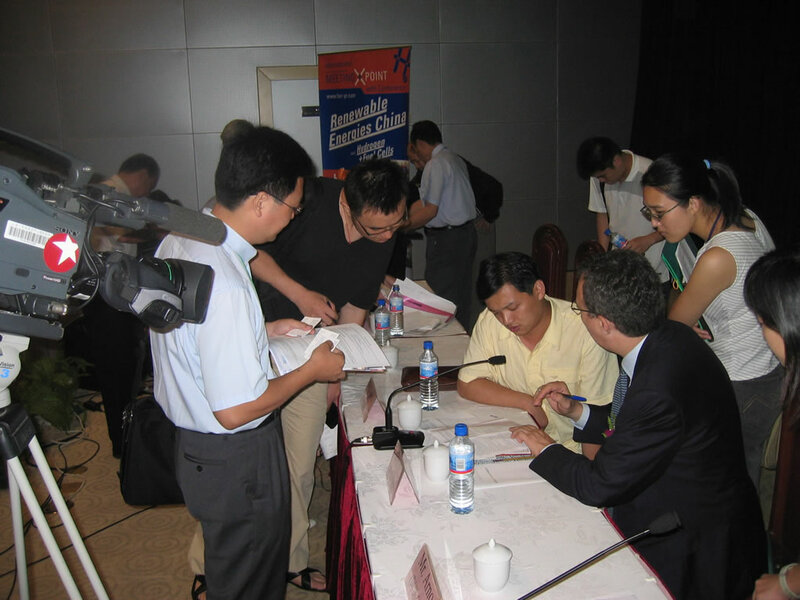 Li Chenhao, (middle picture, second left), Program Officer, International Cooperation, from Science & Technology Commission of Shanghai Municipality is exchanging his business card with a journalist. 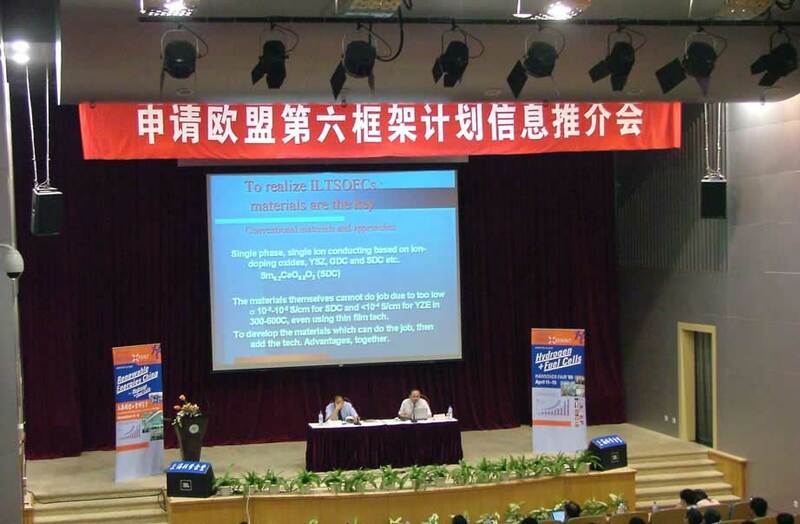 James Ding (left picture left) from Shanghai Shen Zheng Int’l Business Consultant Co., Ltd, Shanghai, P.R. 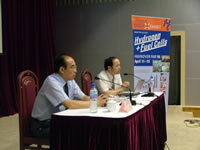 China together with Bin Zhu, Ph D. (left picture right) from Royal Institute of Technology (KTH) Stockholm, Sweden with his speech on Technology Development of H2/FC at international Cooperations. James Ding (middle picture, right) from Shanghai Shen Zheng Int’l Business Consultant Co., Ltd, Shanghai, P.R. 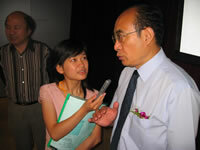 China at an interview with a representative from a Chinese newspaper. 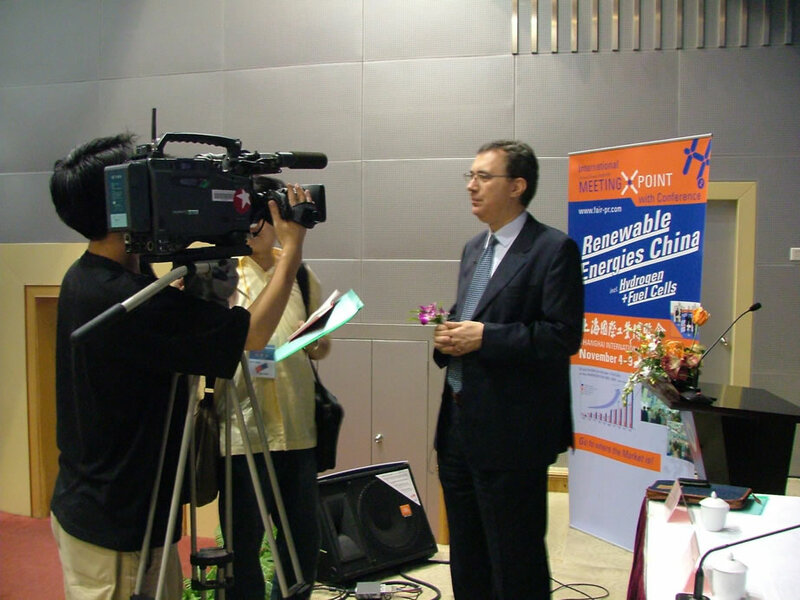 The interest of the media in this event (picture right) was very high, representatives more than 10 newspapers and one Television Station (CCTV9) attended. Arno A. Evers from Arno A. Evers FAIR-PR, Starnberg, Germany giving his explanations about future cooperation and market perspectives of Hydrogen and Fuel Cell for European and Chinese Companies and Research Institutions. 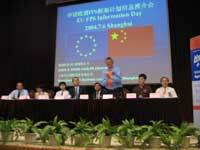 The European Union is planning to offer some 50 million euro (US$ 60 million) this year in annual aid to support Chinese researchers who want to participate in international scientific projects, a senior official with the EU said yesterday in the city. The donation is a five-fold increase over last year. 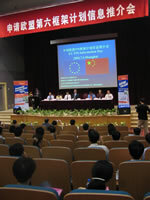 The annual grant is part of the EU’s Sixth Framework Program – a global program to encourage multinational science and technology projects – which includes nearly 600 million euro to support non-EU countries from 2002 to 2006, with a special focus on developing countries such as China. 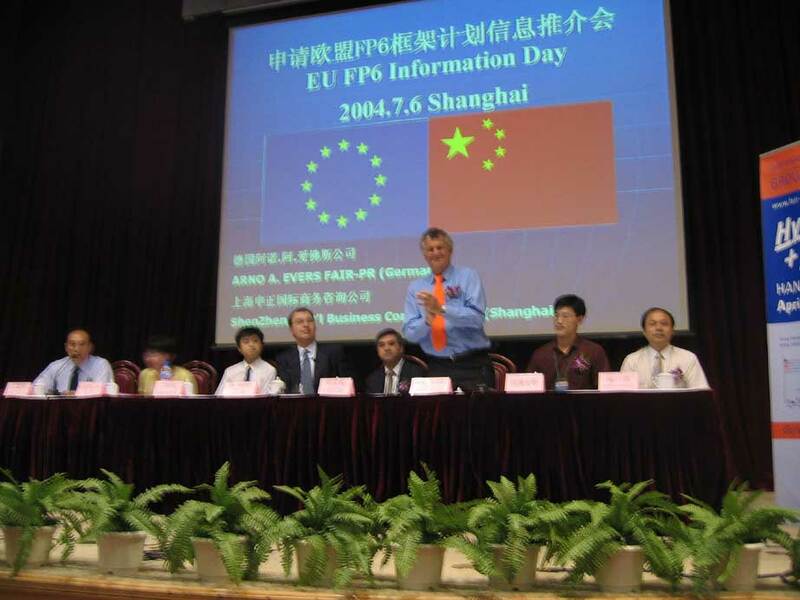 “We are here to find possibilities of collaborative scientific projects which will benefit both the EU and China,” Jurgen Sanders, a first counsellor of science and technology from a delegation of the European Commission in China, said yesterday at a promotion meeting in Shanghai. 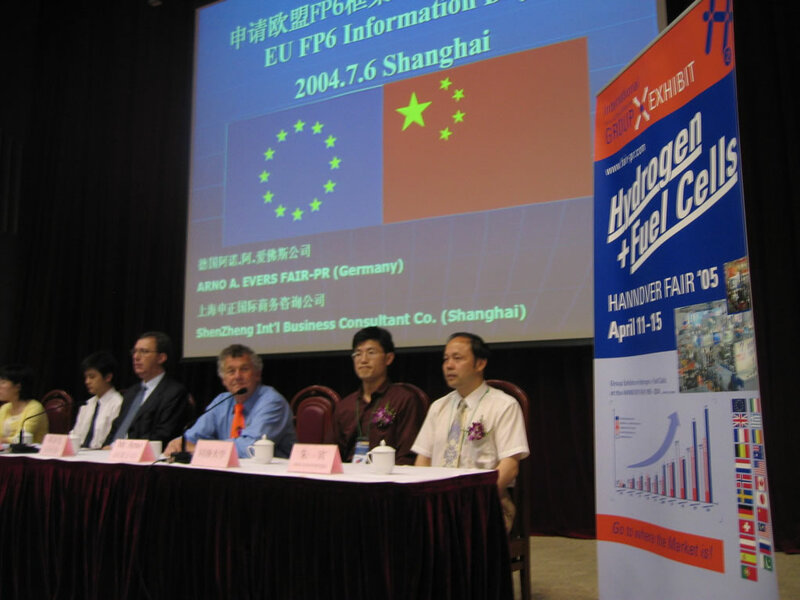 Given the proper purposes, Chinese research organizations, both state-owned and private, can apply to get sponsorship from the EU in nine fields of collaborative research. 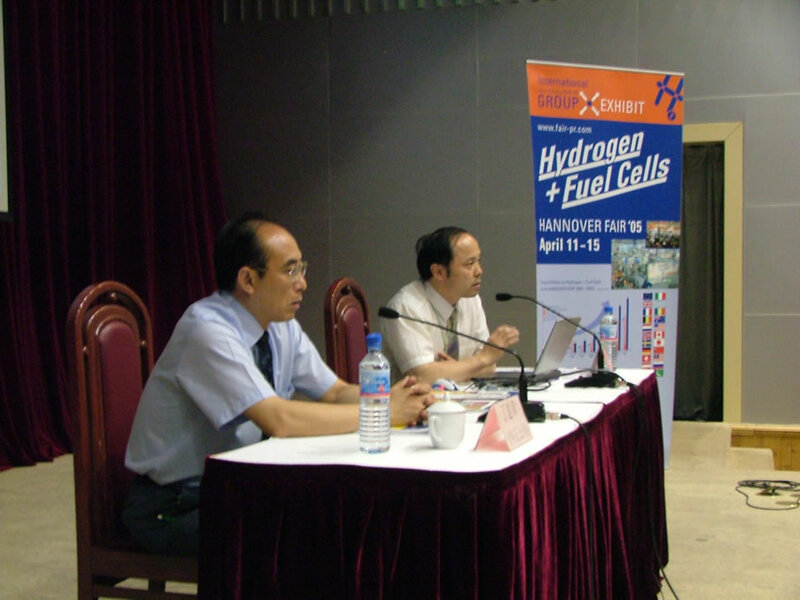 such as the development of intelligent materials whose substance exists at one billionth a meter, food quality and safety, aeronautics and space exploration. However, it’s not easy to win such sponsorship because each supported scientific project must be multinational and include at least three partners from different EU member states and associate states. 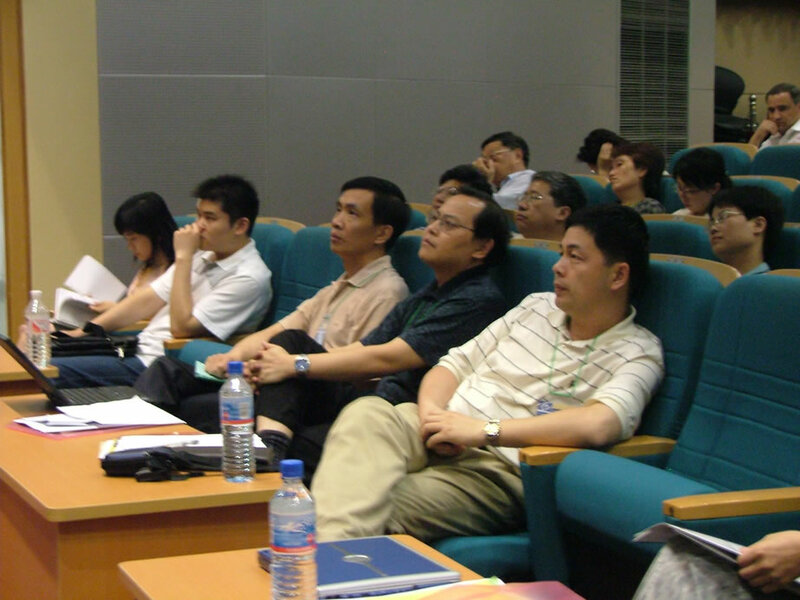 Naturally, the intellectual property rights, once any project is completed, will be shared among its participating organizations. 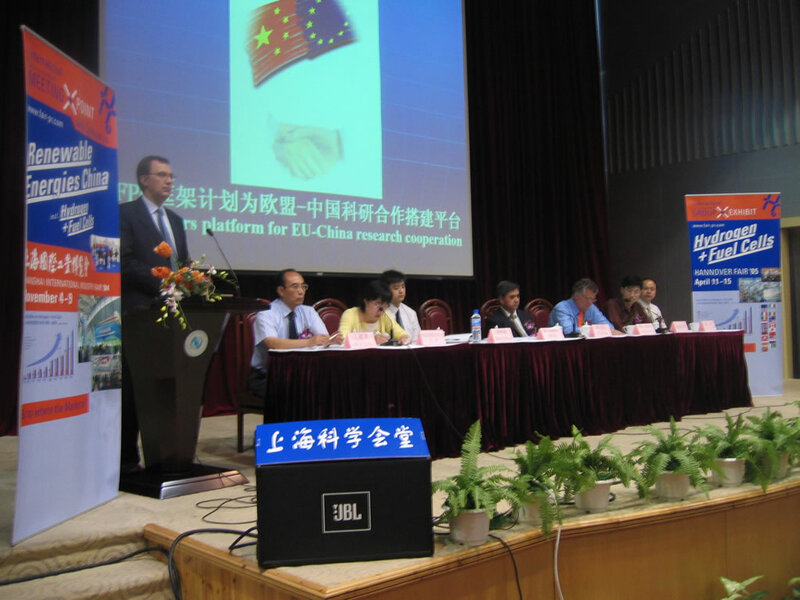 The application is a three-step approach: to find relevant partners in Europe; to prepare a project proposal; and to inform the Chinese Ministry of Science and Technology. 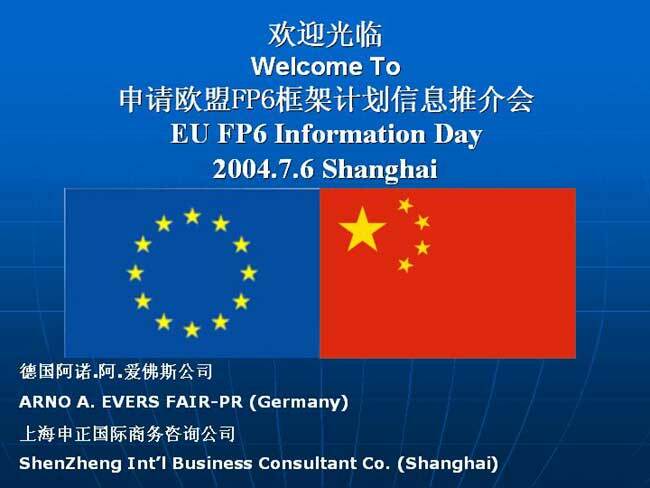 EU officials said they will show preference to projects that aim to solve realistic problems in developing countries such as those related to environmental protection. 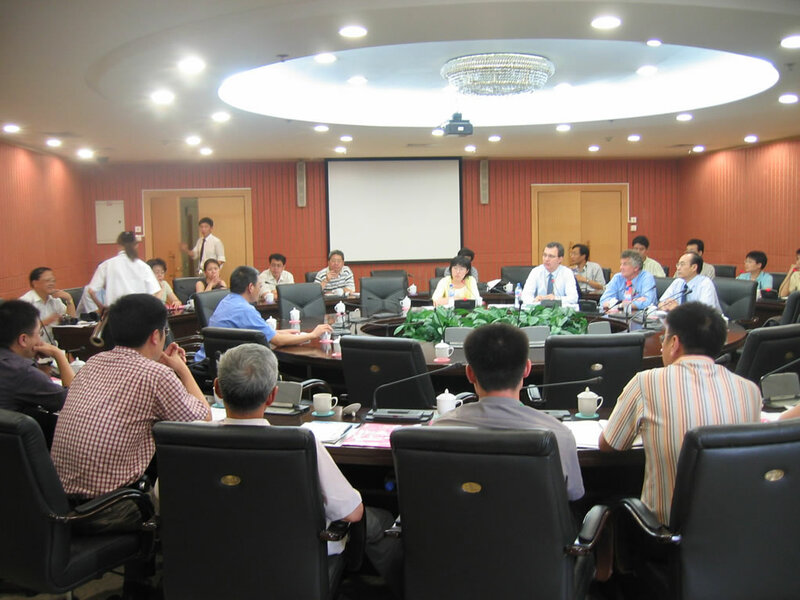 The institute of structural engineering and disaster reduction at Tongji University is one of the Chinese organizations supported by the EU to participate in a multinational research project in natural disaster reduction.